Many of the aromatic plants that can be found in your herb garden belong to the Lamiaceae family. They are generally aromatic in all parts and easily propagated by stem cuttings. Many (but not all) have square stems, with leaves oppositely arranged, featuring flowers grouped in clusters with 5 united petals and 5 united sepals. Labiatae, the original name of this family referred to the fact that the flowers typically have petals fused into an upper lip and a lower lip (labia in Latin). 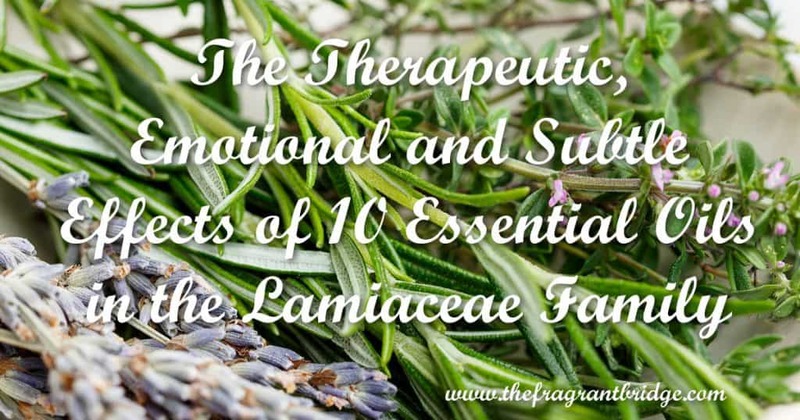 Essential oils from the Lamiaceae family include basil, clary sage, hyssop, lavender, marjoram, melissa, monarda (Monarda didyma), oregano (Origanum vulgare), patchouli, peppermint, rosemary, sage (Salvia officinalis), savory (Satureia montana), spearmint (Mentha spicata), spike lavender (Lavendula latifolia) and thyme. This plant family has sedative, diuretic, tonic, antispasmodic, antiseptic, antidepressant and nervine properties in common. Why not try growing a few of these in your garden? Seeing how they grow can help connect you to the plants and the oils they produce on a deeper level. 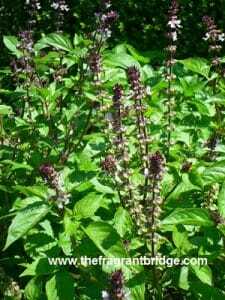 Basil Sweet (Ocimum basilicum) Basil has been used as a culinary and medicinal herb for millennia. It is a strongly aromatic annual herb, reaching 20 inches (50 cm) in height, with shiny green oval leaves and whorls of small white flowers. Sweet basil is helpful for respiratory conditions including sinusitis, colds and flu. It is useful also for digestive complaints of nausea, vomiting, hiccups and cramping. Because of its febrifuge qualities it has been used in compresses for fevers. It is helpful for fear, sadness, depression, stress and insomnia. It can ease anxiety, relieve intellectual fatigue and bring clarity. Gabriel Mojay states that basil is indicated for those in whom despondency and dejection are coupled with a heightened need for emotional support and reassurance. Avoid using on individuals with hypersensitive, diseased or damaged skin. There is a low risk of skin sensitization. 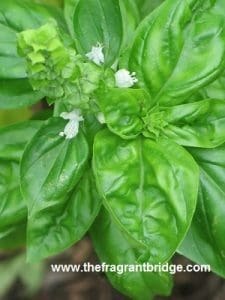 Some sources also recommend not using basil during pregnancy or on children under 2 years of age. Sweet basil with its high percentage of linalool is safe to use in aromatherapy but care must be taken with the methyl chavicol, eugenol and methyl cinnamate chemotypes. It is not recommended to use these chemotypes on the skin or in dilutions of more than 2%. The oil should not be taken orally. Clary sage is a biennial or perennial herb that can grow to a height of 4 feet (120cm) with hairy heart shaped leaves and numerous, small pale blue, lavender, pink or white flowers. Clary sage is useful for women. It can ease premenstrual tension, encourage labour, lessen post-natal depression and help with hot flashes, night sweats, headaches and the irritability that may occur during menopause. Clary sage’s antispasmodic properties can relieve muscular aches, pains, stiffness and tired aching legs. It can also help asthma sufferers by relaxing the bronchial tubes spasms and easing their anxiety about breathing. 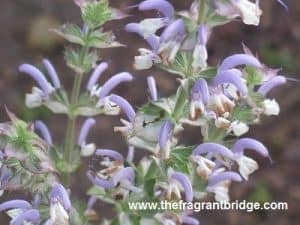 Clary sage helps to relieve deep seated tension allowing the person to relax and also helps to stimulate mental clarity which can be clouded by confusion and constant mind chatter. 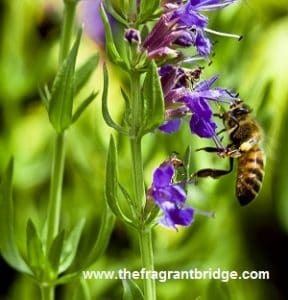 Clary sage feeds the soul and helps us get through rough and meagre times. It is useful for people involved in creative work and opens the path to the unknown, unusual, creative and intuitive. It has also been said to encourage vivid dreams and assist with dream recall. Some sources recommend not using clary sage during pregnancy while Patricia Davis also recommends not using it when drinking alcohol as it can induce nightmares. Hyssop (Hyssopus officinalis) Hyssop is a perennial herb up to 22 inches (60 cm) with a woody stem and purplish blue, pink or white flowers. Hyssop is another good oil for colds, sore throats, flu, bronchitis, sinusitis and asthma but should be used in low dilutions. It is also useful for digestive issues including relieving stomach cramps, abdominal bloating, to increase appetite, as a mild laxative and to expel worms. Hyssop can be used for poor concentration, enhancing alertness and mental clarity and to centre you during meditation. It is said to ease emotional pain by bringing deep feelings into focus. It is important to know which variety of hyssop you are using as hyssop can be obtained in 2 varieties. In both cases it is wise not to use the oil above a 2% dilution. Hyssopus officinalis var. decumbens has no known hazards while Hyssopus officinalis CT pinocamphone should not be used during pregnancy, breast feeding or on children under 2 years of age. It also should not be used on individuals with epilepsy and high blood pressure. Lavender (Lavendula angustifolia) Lavender is an evergreen woody shrub that grows up to 3 feet (1metre) tall with green narrow linear leaves and violet blue flowers in terminal spikes borne on slender stalks. Lavender is useful for respiratory complaints, coughs, colds, flu, bronchitis, asthma, catarrh and sinusitis. It is also works well for wounds, ulcers, dermatitis, eczema, psoriasis. Lavender’s antispasmodic properties help ease tension headaches, period pains, muscular aches and pains. Lavender is well known for healing and lessening the pain of minor burns and sunburn. 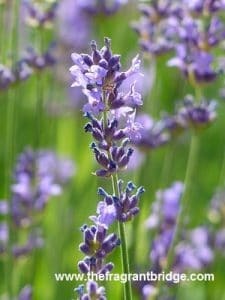 Lavender is a calming oil when used in small amounts but can be very stimulating in larger amounts. It is helpful for depression, insomnia, nervous tension and stress. Gabriel Mojay calls lavender an aromatic ‘Rescue Remedy’ that works to calm any strong emotions that threaten to overwhelm the mind. Marjoram Sweet (Marjorama hortensis) Sweet marjoram is a perennial plant that grows up to 30 inches (80cm) high with a hairy stem, dark green oval leaves and small white flowers in clusters. Sweet marjoram is effective for muscular aches and pains, strains, sprains, painful periods and dispersing bruises. It is also a good digestive and carminative helping to alleviate constipation, colic and flatulence. Sweet marjoram relieves stress, anxiety, nervous exhaustion, calms the mind and helps quiet obsessive thoughts. It has a comforting and warming effect which eases loneliness and grief but should not be used to excess as it can have a deadening effect on the emotions. Melissa is also known as lemon balm or balm. It is a bushy herb which grows 11 to 23 inches (30 – 60cm) high with serrated oval to heart shaped leaves and tiny white or pink flowers. Melissa is an antiviral oil that has been shown to be effective for cold sores and shingles when applied to the blisters in the early stages. It is a good digestive oil alleviating nervous indigestion, nausea and flatulence. Its antispasmodic properties can assist in the relief of menstrual pain and tension headaches. Melissa is helpful in depression especially in those who are emotionally sensitive and do not respond well to pressure and are easily traumatized by confrontation. It has been said that Melissa aids us in finding inner contentment and strengthens the wisdom of the heart. Possibly sensitizing and should not be used on hypersensitive, diseased or damaged skin. Don’t use in pregnancy or children under 2. Best not used in dilutions above 1%. Know your source of melissa as there are imitations of the oil made using citronella (Cymbopogon nardus), may chang (Litsea cubeba), and lemon (Citrus limonum) plus various isolates and synthetics. Patchouli (Pogostemon cablin) Patchouli is a perennial bushy herb up to 3 feet (1 metre) tall with sturdy hairy stems, large furry leaves and white flowers tinged with purple. Patchouli is a very useful skin oil helping to heal rough cracked skin, sores, acne, eczema, dermatitis and wounds. It is also used for fluid retention, cellulite and diarrhoea. Gabriel Mojay believes it is one of the most important remedies for snake and insect bites. Patchouli is a very grounding oil that is helpful in cases of anxiety and depression. It helps keeps one in touch with their physical body. There is none known for dermal use but possible inhibition of blood clotting if taken orally which is not advised. 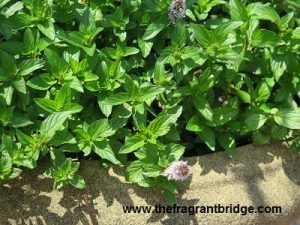 Peppermint (Mentha piperita) Peppermint is a perennial herb up to 39 inches (1 metre) high with underground runners, sharply toothed, lance shaped leaves and white occasionally mauve flowers. 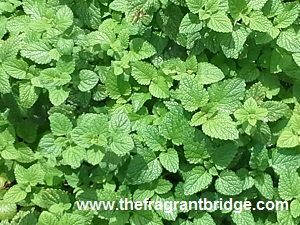 Peppermint is effective for both respiratory complaints including colds and flu, sinus congestion and chronic bronchitis. It is well known for helping digestive issues, flatulence, colitis, indigestion, colic, diarrhoea, nausea, vomiting and travel sickness. It is also effective for muscle pain, lumbago and bruising. Peppermint refreshes the mind when mentally fatigued bringing clarity and also facilitates the digestion of new ideas. It can also assist in reconnecting you to your vital passion. It is possibly sensitizing, low risk mucous membrane irritant and should not be used in cases of cardiac fibrillation or G6PD deficiency. Don’t apply to or near the face of infants or children. Rosemary (Rosmarinus officinalis) Rosemary is a shrubby evergreen bush up to 50 inches (180cm) high with silvery green, needle shaped leaves and pale blue flowers. Rosemary is available in 3 chemotypes each suited to a different purpose. Rosemary 1, 8 cineole is a good respiratory oil helping with colds, flu, catarrh, sinusitis and asthma. 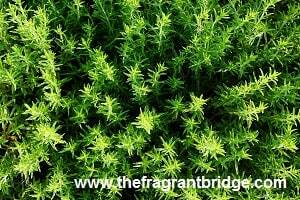 Rosemary camphor is useful for relieving the pain of rheumatism, arthritis and tired, stiff overworked muscles. It also warms cold feet and hands and energizes tired legs. Rosemary verbenone is excellent for skin care and tissue repair. It is gentler than the cineole chemotype and can also be used for respiratory issues. 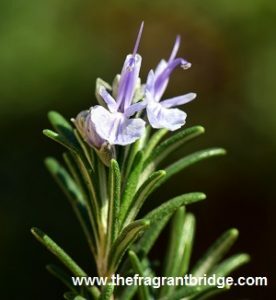 Rosemary has been known as an oil of remembrance since ancient times, helping us to not only remember on a physical level but also on a spiritual level our true selves. It strengthens our mental clarity and awareness, improves poor concentration and is uplifting and stimulating. Tisserand and Young suggest not applying rosemary on or near the face of infants or young children while others suggest not using it at all on children under 2 years of age. Some sources also suggest not using it during pregnancy or with those who have epilepsy. Rosemary verbenone is considered the safest of the three while the camphor chemotype maybe neurotoxic depending on the camphor content and amount used. 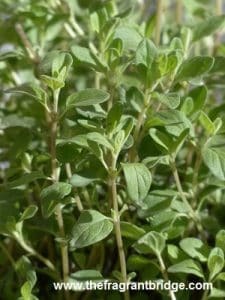 Thyme (Thymus vulgaris) Thyme is a perennial evergreen herb up to 15 inches (45 cm) high with a woody root, grey green leaves and white to lilac flowers. Thyme comes in various chemotypes with the geraniol and linalool being the gentlest. The thymol and thujanol chemotypes are harsher and require more care in their use. Thyme is a good respiratory oil helping with colds, flu, coughs, sore throat, bronchitis, asthma and whooping cough. It is also useful for relieving the pain of rheumatism, arthritis, sciatica and muscular aches and pains. Thyme is stimulating and relieves anxiety, nervous and mental exhaustion, enhances concentration, uplifts the spirit and helps with poor self-confidence. Use in low dilution as it can irritate the mucus membranes and possibly cause skin sensitization. Some sources suggest not using on children under one year of age. In many cases it is preferable to use the linalool and geraniol chemotypes as they have many of the same properties as the thymol and thujanol chemotypes but are gentler oils with a softer aroma. 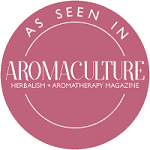 This article was originally published in the May 2017 issue of AromaCulture Magazine (www.aromaculture.com) and has been adapted for use here with permission from the publisher. 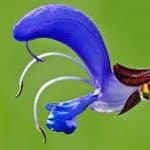 This entry was posted in Essential Oils and tagged clary sage, hyssop, lavender, melissa, patchouli, peppermint, rosemary, sweet basil, sweet marjoram, thyme on July 11, 2018 by Carole Hodges.